In 12-inch wok or nonstick skillet, heat oil over medium-high heat. Cook chicken in oil 4 to 5 minutes, stirring occasionally, until no longer pink in center. 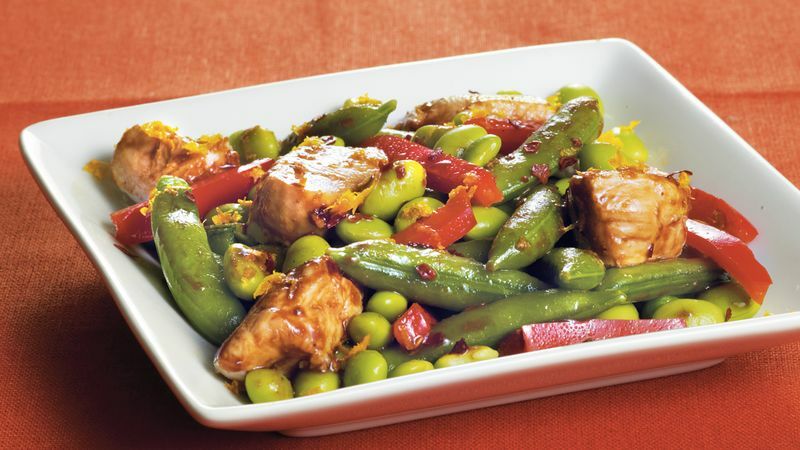 Add edamame, snap peas and bell pepper; cook 2 to 3 minutes longer, stirring frequently, until vegetables are crisp-tender. Stir in remaining ingredients. Cook and stir 1 minute or until hot. Like your stir-fry spicier? Add 1/8 to 1/4 teaspoon Thai chili sauce. Complete this meal by serving the stir-fry with hot cooked steamed jasmine rice.